This is a photo of us working on a culvert at Lilly Lake. It is my favorite photo because to begin with, we could not get any of the logs to line up, fit in, or lay the way we wished around the culvert. Taking much longer than expected, after we took some time to clear our minds and think of new ways to attack this project, we all worked together to compress the logs together with rock bars and ratchet straps. It was a struggle at first, but we figured out the project together. My favorite work project was the two day Lawn Lake trail maintenance runs. We maintained the 16 mile trail beginning at Lawn Lake trail head, ending at the lumpy ridge trail head. Being a returner from last year, I had done this trail before. Last year we did the 15 mile run, with 12 people, and we had to hike out early, not finishing the last 3-5 miles of trail. Doing the run this year, with 6 crew members as opposed to 12, we finished the whole trail, and that’s when I knew, this crew was dedicated, for real, and can do great things when we are focused. My favorite memory from the year was a recreational hike that about 8 of the members did through the lion lakes, up hourglass ridge, up to mount Alice. As we got closer and closer to Alice, we realized the mountain wasn’t what we expected. On either side of the mountain there were straight vertical cliffs, with in between a less vertical section, maybe a 70 degree angle scramble that was seemingly the only way to ascend. Looking nearly impossible and scary, we attacked it and had no issues making it up the climb, where the top was very rewarding. 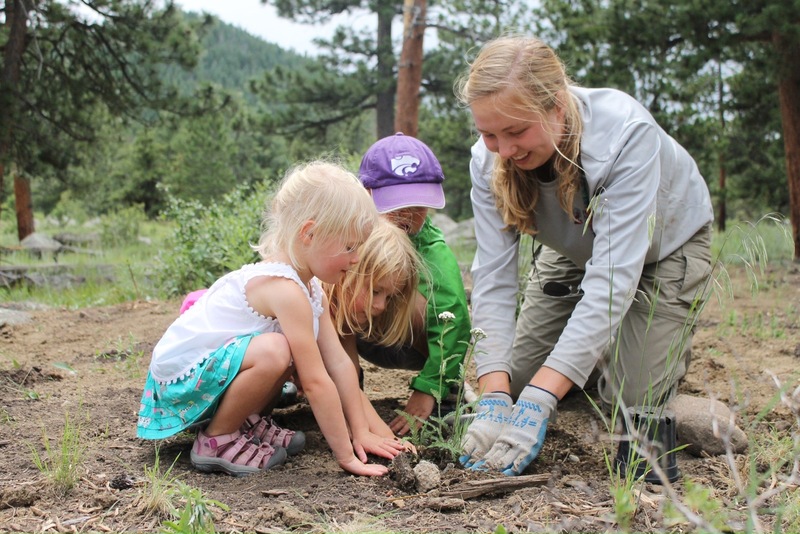 I am really passionate about environmental education, and I would love to pursue that as a career in the future. Some kids walked by while we were rehabbing a site, and we helped them plant a few things. The parents were excited to bring the kids back in a few years to look at the plants. This photo reminds me of the positive impact we can have on kids and their outlook on the environment around them. My favorite memory is from our last day of work. We did a 17 mile maintenance run to lost lake. Everyone was in a great mood, and it was a perfect way to end the season. It helped me reflect on everything we did, and appreciate how great of a summer it was. I’m so thankful I got to spend my summer with my crew, as well as Dave and Matt from NPS. 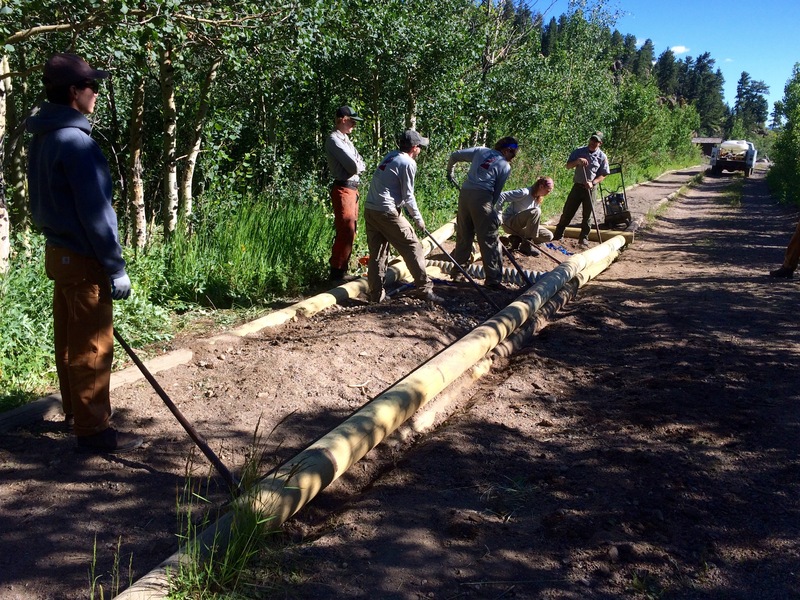 My favorite work project of the year was working on the trail at cow creek. We got to work with llamas, which was a blast. It was also amazing to see the change in the trail from start to finish. The trail is a busy one, and our work made it much more accessible. I learned a lot of new skills on this project as well, including how to put log checks in, and how to retread a trail. This is my favorite photo. 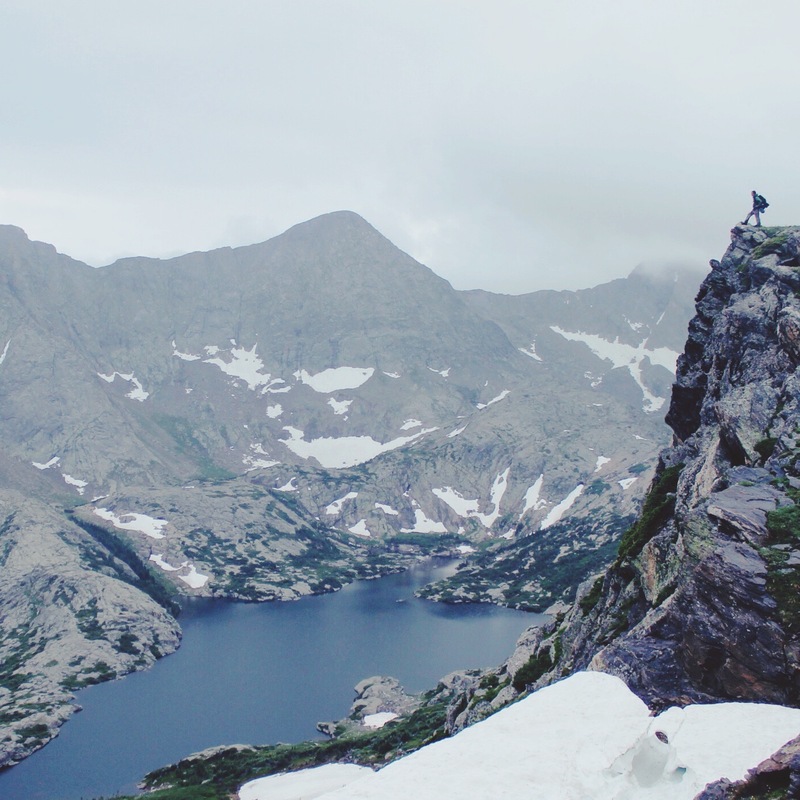 Crew Leader Bryce is standing over Arrowhead Lake, which seems so untouchable from Trail Ridge but here Bryce has conquered it. My favorite memory of the summer has been volunteering on Fridays in the Back Country Office of the park. It was wonderful working one on one with visitors and becoming closer with park employees. My favorite part of work was maintenance runs on the trails. 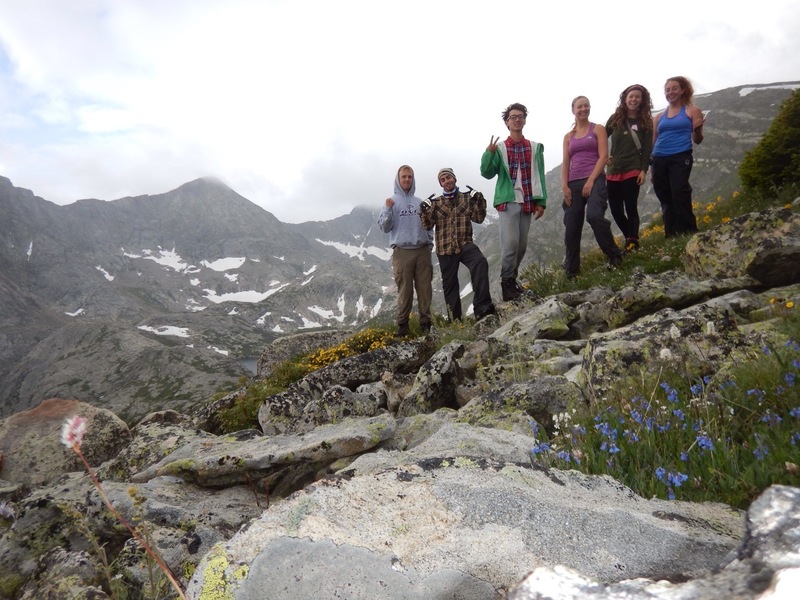 We explored so many trails together as a crew and enhanced the hikers’ experiences. This is my favorite photo because I think it sums up the camaraderie we had on the Estes crew this summer. We always worked very well as a team and we could make practically whatever situation we were in humorous. In this picture we were working with the park service on a bridge that was washed away by flooding. 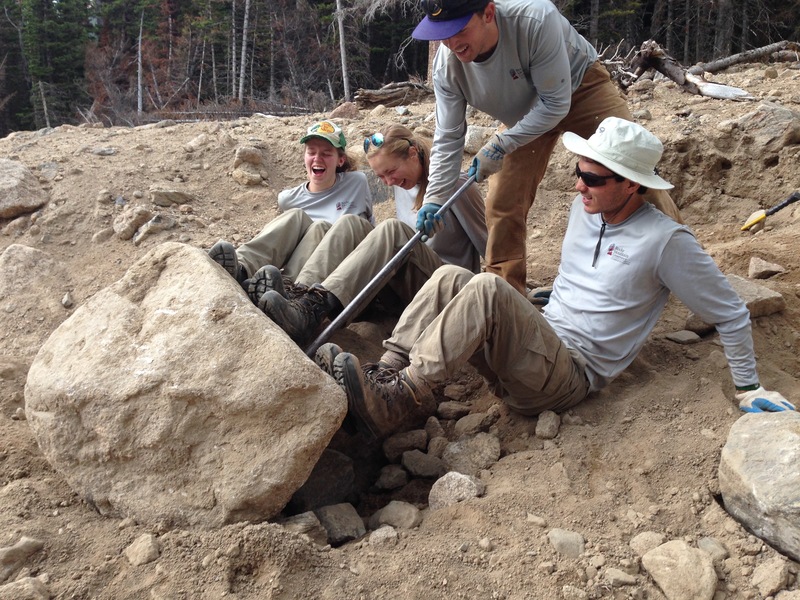 We had to collect large rocks in order to make the abutment for the bridge. It is hard work but we we’re laughing and joking through it practically the whole day. My favorite memory this year was the family dinners our crew had every week. Every week, the guys on the crew would cook on Mondays, and the girls would cook on Wednesdays. It was a great way to save money on food and to get more variety in our diet. We came up with some very interesting culinary creations such as grilled cheese doughnuts. Overall, I feel like the Estes crew bonded and made fantastic memories by sharing meals with each other twice a week. My favorite work project this year was working at Tuxedo Park with the Park Service’s restoration crew. The area had been disturbed by the construction of a shuttle bus shelter. We started off by removing any invasive species in the disturbed area. We then planted a variety of native plants for the rest of the week. It was amazing to see the area get a second chance and I think one could get the feeling that they were making a positive impact on the Park. It was very educational to learn new native species of plants. Since I was assistant crew leader that week, I got to do an educational presentation on edible and medicinal plants that are found in Tuxedo Park. I really enjoyed talking about these amazing plants and their uses throughout history and in modern herbal medicine. This was probably my favorite work photo. 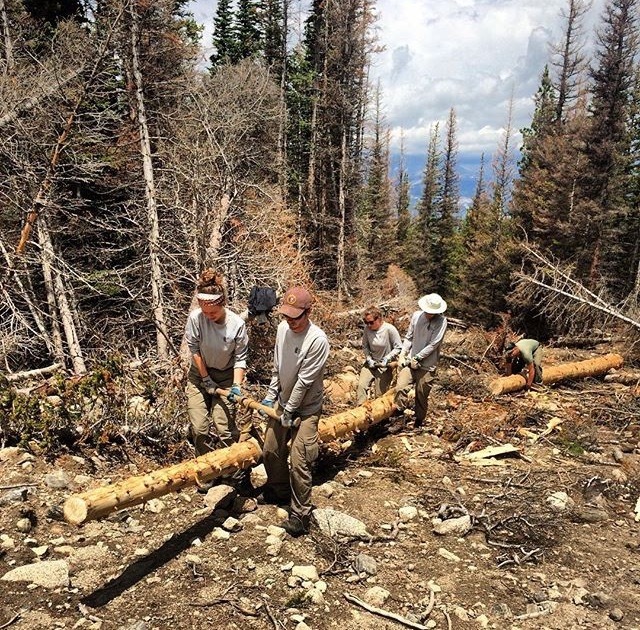 This was one of the most fun days of work along with feeling like we actually got a lot of work done, working to clear a pile of logs away where a landslide washed out a trail. We worked really hard as a team that day rather than just digging drains individually. My favorite memory was the Ida trip. It wasn’t perfect and it wasn’t fun the whole time but I still liked hanging out as just the Estes crew in the wilderness. My favorite photo was us at the top of Forrest Canyon after a long, wet, and tiring overnight trip. It was the hardest I ever worked for a photo. My favorite memory was jumping into some of the lakes we hiked to, including lawn lake and lost lake. They were cold, but always refreshing and fun to look at a map and point to where I have swam.